Alkali supplements are used to treat calcium kidney stones owing to their ability to increase urine citrate excretion which lowers stone risk by inhibiting crystallization and complexing calcium. However, alkali increases urine pH, which may reduce effectiveness for patients with calcium phosphate stones and alkaline urine. Hydroxycitrate is a structural analog of citrate, widely available as an over-the-counter supplement for weight reduction. In vitro studies show hydroxycitrate has the capacity to complex calcium equivalent to that of citrate and that it is an effective inhibitor of calcium oxalate monohydrate crystallization. In fact, hydroxycitrate was shown to dissolve calcium oxalate crystals in supersaturated solution in vitro. Hydroxycitrate is not known to be metabolized by humans, so it would not be expected to alter urine pH, as opposed to citrate therapy. Preliminary studies have shown orally ingested hydroxycitrate is excreted in urine, making it an excellent candidate as a stone therapeutic. 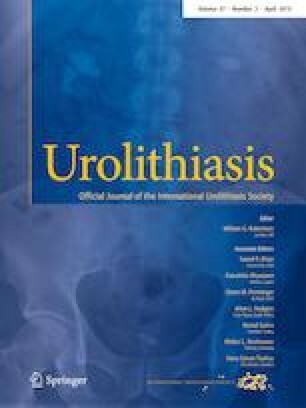 In this article, we detail the crystal inhibition activity of hydroxycitrate, review the current knowledge of hydroxycitrate use in humans, and identify gaps in knowledge that require appropriate research studies before hydroxycitrate can be recommended as a therapy for kidney stones. J.D.R. acknowledges support from the Welch Foundation (grant E-1794). J.R.A. and J.D.R. have filed patent applications on the use of hydroxycitrate and other modifiers as growth inhibitors of pathological calcification.